Miracle Foot Repair® Foot Cream with 60% Pure Aloe Vera Gel from Miracle of Aloe® For Dry, Cracked, Itching Feet If you have dry, cracked, or itchy feet, don’t wait another day to try our aloe foot repair cream. Miracle Foot Repair is 60% Aloe Vera - - nature’s own healer - - combined with special polymers. Penetrates deep down to lubricate and promotes the formation of healthy skin tissue. Regular use will keep your feet feeling silky-smooth and sleekly comfortable. Join the thousands and thousands who are already benefiting from this special formula. Convenient 8-oz. tube. 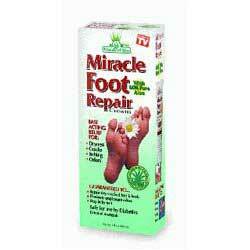 BOOKMARK THIS PAGE Miracle Foot Repair 8 Oz.